This was a book that I have had on my shelf for almost a year. It was a book that I just took a chance with. It was a book that I am glad I took a chance with. I started the book and was immediately flying towards the stars and off on an adventure with a boy and his dog. This was such a beautiful story of an eleven year olds perseverance in accomplishing a dream and making it a reality. An eleven year old who says that he is really thirteen based off what he can already do goes on a journey where people from the most unlikely of places help him find people lost and help discover new family. Is it bad that I did care a lot more about the whereabouts of his missing dog throughout the story? I haven't decided. Is it bad that when something good happened, I cried? Nah. However, there were a lot of other moments where I smiled, I laughed, I yelled in frustration and I cried some more. Jack Cheng writes a stellar story about a boy, his dog, new friends, and one big family. Told in a series of "transmissions," this is an adventure you do not want to miss. 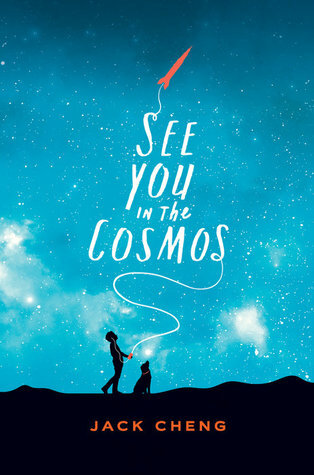 See You in the Cosmos is a brilliant novel that shows a side of mental health in a way making the overall read more real. Cheng won my heart with just a boy, his dog and one big dream.